I know I’ve been busy. I’ve been juggling and multitasking and crossing things off my list. And I’ve been exceedingly proud of how on top of it all I’ve been. Especially when I managed to pull off a seven-layer cake for my husband’s birthday celebration at the family Chanukah party. Apparently no bakery in PA has heard of a seven-layer cake, but it is his favorite cake and I found a way to get him one for the Chanukah party the night before his birthday. I was proud. Then his birthday rolled around, the next day. 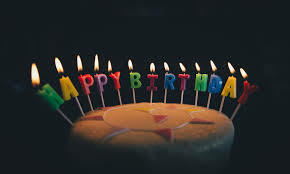 And it wasn’t until my teenage son wished my husband happy birthday – about 11:50 or so – that I realized that I’d forgotten to celebrate it, or him, on the actual day. Not a birthday wish. Not a birthday kiss. Nothing from me. Now, I could give you my many excuses. I have many excuses. I even had a gift waiting upstairs. But the bottom line is that I forgot to acknowledge his birthday on his birthday, until I was reminded. The good thing is that my husband didn’t really care. He doesn’t care about birthdays as much as I do, and he didn’t feel slighted. I think he thought it was funny, and he probably thought that he got a “get out of jail free card” for the next time he forgot something or dropped the ball. But I felt bad. And I had to admit that one of the reasons I may have forgotten to acknowledge it and him is that I’ve been going a bit on warp speed. It’s that time of year. Life is busy. Work is full. My whole family is coming to celebrate Christmas in a week. Again, there are many excuses. But it made me stop to appreciate what I have, who I live with, and the fact that I need to slow just a little so that the things I forget are not the big ones. I don’t want to miss a minute. I don’t want to forget to enjoy and express. And I certainly don’t want to ever forget to wish my husband happy birthday again. Great blog, Lisa! Happy Birthday, Bruce! I can completely imagine this, and having been at warp speed for about a month nonstop as well, I know the feeling. So let’s SLOW DOWN, BREATHE, and be in the moment as much as possible. This is the promise to myself for Christmas -not to be so busy planning and arranging that I can’t actually be there and enjoy these people that I love. Thank you Don. I try and remember to appreciate those that truly matter every day, and you’ve inspired me to do that even more! Thank yoU!